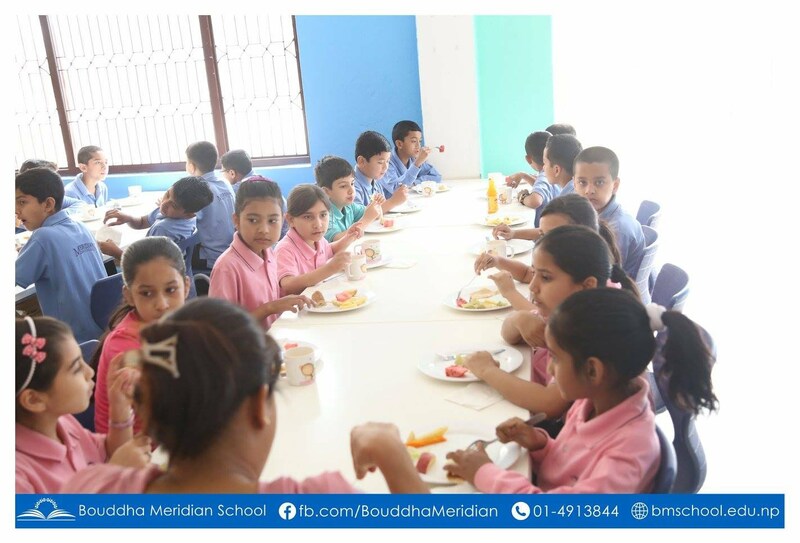 The goal of dining service in Bouddha Meridian School is to make dining experience the best. It is done by providing good and nutritious food in a relaxed, clean and healthy atmosphere. Menu is prepared in such a way that it includes all types of nutrients. And mealtime at Bouddha Meridian School means delicious food in a comfortable setting. We also teach our students eating habits and manners. Our students take their food themselves in a queue in a systemic manner and have it in a properly managed dining hall. Teachers encourage the students to follow disciplined dining habits and have all kinds of food. These important life skills learned during mealtime develop feeling of community and confidence among our students. Our chef and dining staff always encourage the students to share their feedbacks. Our dinning hall is clean and safe all the time. We know children are quite susceptible to food borne illness and we always take the proper steps to ensure that all foods are safe for consumption. In future, we are planning an educational information that always strives to send a positive message about food by reinforcing the power of fresh vegetables, fruits, legumes and whole grains. And also, a canteen is going to be opened soon so that students can enjoy the variety of food of their own choice. Lastly, we always welcome the suggestions for the betterment from parents.